Electric kiln firing is probably the most common firing method, but that doesn’t mean that it has to yield the most common results. Creative potters and ceramic artists are doing amazing and beautiful things with electric kilns and here you’ll read articles and see the incredible work that proves it. Plus, if you haven’t already, be sure to download your free copy of the Electric Kiln Firing Techniques and Tips: Inspiration, Instruction and Glaze Recipes for Electric Ceramic Kilns, a collection of articles detailing how creative potters and ceramic artists are using electric kilns to create exquisite ceramic art. Even if you plan to do primarily atmospheric firing in a fuel-burning kiln, you’ll probably want to bisque fire in an electric kiln. So you may have perused Craig’s list for electric kilns for sale. A kiln is a big purchase so it is a good idea to know what type of kiln you need for the work you make. That’s where we come in! 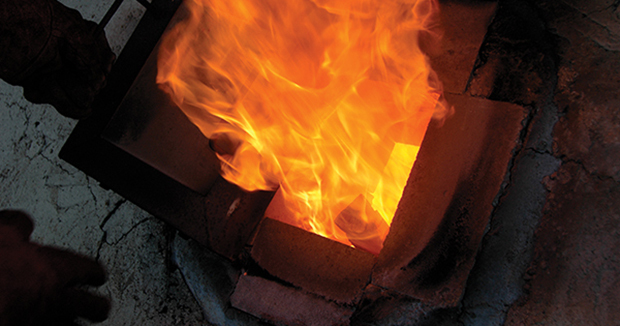 We have an article specifically geared toward those who are looking to buy a kiln. You’ll also need information on how to fire an electric kiln. We can help you out with posts on the principles of electric kiln firing and how to get the best results with electric kilns. And before you fire, you’ll need to make sure you have the proper kiln ventilation system, and we’ve got you covered there too! Not only can electric kiln firing produce great results, but electric kilns also offer control and dependability. And electric kilns keep becoming more versatile, economical, and easy to use with advances in electric kiln controllers, energy efficiency, materials, and safety. So jump into the archives today and improve your electric kiln firing results and take advantage of the incredible potential offered by electric kiln firing.